We now have a mailing list of people looking for this clown. I’m looking for a KinderGUND 12 inch Tickles? clown where the clown’s velour body is solid blue on one side and solid yellow on the other. It has yellow velour feet. It was purchased in 1987. He is the small velour baby version..no removable clothes. I am desperate to find it for my son who is now 24. 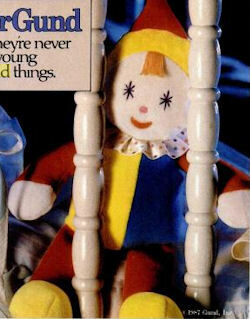 All his baby photos feature it, but Clowny went missing 20 years ago. No, Rebecca. That’s not it, BUT someone is looking for the AMTOY one, so I sent the link to them. I am desperately looking for this clown, if anyone has a way of finding one please let me know. Also looking for this little guy. Please help!! I don’t know how anybody had better luck on eBay than I did, lol.